After a quick trip to Houston to support James Harden last week, Khloé Kardashian was back in Los Angeles for Halloween, and back by the side of Lamar Odom. Kardashian celebrated Halloween at her husband's bedside at Cedars-Sinai Medical Center. She posted a photo of a plastic pumpkin candy jar and candy in a room with a hand sanitizer dispenser and medical devices. 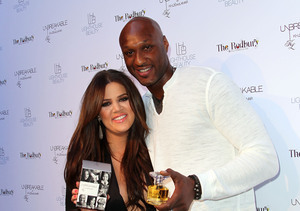 She confirmed that she was spending the day with Lamar in a few tweets. Read the tweets! @JasonRoach77 thank you!! I was laying low, spending time with lam so he wasn't alone but it was nice. How was yours? @khloloverdoll no I didn't. I was laying low at the hospital. What did you dress up as? 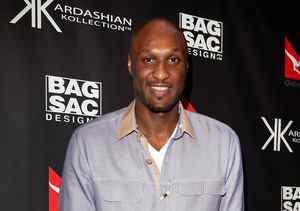 Lamar's health has reportedly been improving, and he is no longer in danger of needing of a kidney transplant. A source told Us Weekly, "He is getting stronger ever day. And [he] has a great team of therapists and specialists working with him. He's 6-foot-11 and weighs a lot, so getting him to walk a little has been really hard."